$5 minimum withdrawal threshold. One free withdrawal per month. When it comes to reviewing brokers, it doesn’t happen often that a company comes along that totally knocks my socks off, but this is an exception. Ayrex is a broker based in St. Kitts and Nevis, operated by a company called Advanced Binary Technologies Ltd. Sadly they are not yet regulated (they are working on, however), and do not accept USA traders. But pretty much everything about this broker is impressive, and you will notice the difference from the moment you navigate to their website. 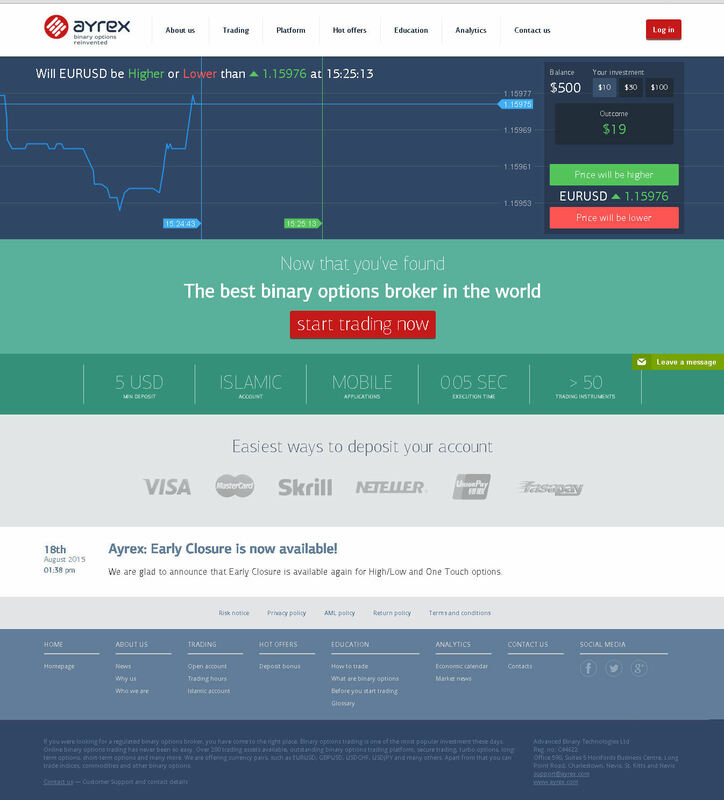 This is the most streamlined, beautifully designed binary options site I have ever seen. This is not just another white-label site with a barely customized template. Everything has been designed from the ground up, from top to bottom. The site is intuitive, easy to navigate, and rich with information. The average minimum deposit to trade binary options online is around $100-$200. On Ayrex, it is just $25. Not only that, but $5 is the minimum trade size, and it is the minimum withdrawal threshold. Contrast this with the numerous binary websites that force you to withdraw $100 or more at a time! Ayrex is ideal for the beginning trader with a small account who wants to take the slow, cautious route learning how to trade. For the serious trader with a small bankroll, this is the only reliable and secure path to success. Ayrex also has another incredible feature, and that is a totally free no-deposit demo account! You do not even have to register to use it. Just click the blue “Demo” button in the upper right-hand corner of the website, and you will be taken straight there. The platform loads quickly, and it is absolutely beautiful. Ayrex designed it from scratch; this is their own proprietary technology. You can test it out right there. Select the type of option you want to trade (Short Term, High/Low, or One Touch), and then pick your asset and enter in your amount. The platform will run the calculation for you and tell you exactly what you stand to win or lose on the fly. Change the amount and it will run a new calculation. Select your expiry, and launch your trade. Ayrex has recently introduced Early Close for High/Low and One Touch trades. I still do not see this function on the demo account, but this is likely because they are in the middle of implementing it. Deposit $100-$499, receive a 10% bonus. Deposit $500 to $999, receive a 10-20% bonus (your choice). Deposit $1,000, and receive a 10-30% bonus (again your choice). Remember, you can deposit less and trade, but there is no bonus if you deposit under $100. If you visit the bonus page on the Ayrex website, you will see a detailed explanation of how the bonuses work and how they impact withdrawals, including some calculated examples which show you the math. Ayrex gets high marks for transparency. These are no-frills packages, and none of them list any additional features. While additional features would be nice (one-on-one training, signals, etc. ), I can see the appeal in their approach. While many brokers offer those extras because they are trying to create value for traders, I think many also use them to distract traders from the areas where they fail to offer value—areas like deposits and withdrawals, terms of service, and general trust. Ayrex has impressed me so much with these often-neglected areas that I am not so concerned about the lack of bells and whistles. There is still no mobile trading on Ayrex, but they are working on adding this feature, so it should be available soon. Trading tools available include an economic calendar and market news. Educational features are currently pretty basic; there are some simple how-to articles, a glossary, a platform manual, and a FAQ. Normally I would complain a bit about the lack of resources, but this is really a very minor drawback in light of all the incredible features Ayrex does have. Plus, there is really no beating a completely free and unlimited demo account when it comes to education! One of the biggest complaints I have with the binary options industry is that most brokers push traders to jump straight into live trading with real money before they even practice. Ayrex is one of the few brokers that not only makes a demo account available, but makes it fully functional for as long as you need it. This is an amazing resource. What about customer service? Ayrex is available 24/5, and offers a web form, an email address, live chat, and a telephone number. Ayrex is one of the binary options brokers offering Bitcoin for trading. In a land of hundreds of SpotOption white label brokers which offer more or less the same mediocre features, platform, and experience, Ayrex really stands out as a unique and exceptional alternative. The effort they have gone to develop their own platform for fast, easy execution, and the incredible design work they have put into their website really sets them apart. The demo account is awesome, and you are not going to find friendlier deposit and withdrawal terms. It is really too bad that USA traders cannot work with Ayrex, but for traders around the globe, they look like one of the most exciting options out there right now. While there is still not a lot of third party information available on them, it will be great to see how they evolve over the coming years. I think they have a bright future ahead of them, and were I to take a chance on a new binary options broker tomorrow, I would make my deposit here. I’m trading for a long time. Sometimes, when I meet new broker I try their platform. I’ve also tried Ayrex for a few times and would like to say that this broker definitely requires your attention. I don’t wanna be like paid advertiser and say that this broker is the best that i have ever tried…blah..blah…blah…NO! I’ve found some cons of their platform. Such as no popular payment methods . They have an icon with CC but they don’t accept them now. Their website is not adapted for the smartphones. What i liked most of all was quick withdrawal process . It took 24 hours to withdraw my funds. Although it can be better with a little adjustment. I will definitely recommend it to my friends and family. How long for have you been using Ayrex? I have been trying their Demo and it looks ok. The only thing I need to get is the right strategy to trade binaries. I have been searching and have not found one that suits me. I´m a Binary Option Trader, I always have participated in the contest Binary Blast, this is a great experience as they compete around 400 people worldwide and if you stay within the top eight places earn money, it is an hour of great concentration and emotions, I have come second twice. My alias is JediTrader. Im using demo for awhile but its turn out that im going to like it.. in 24hrs of using this my money grow for as x5. im so happy using ayrex, i learn a lot in market execution. i recommend to you guys this is for real. anyone there need a part time job or even a job. that your money works for you.. then this is your place.. no hesitation on investing a large one because the larger you invest.. the larger your income.. great thing.. god bless and be a professional trader in near time. Ayrex is an amazing and new binary trading platform. It is a very clear, simple, attractive and easy to use trading platform that is user friendly for beginner level traders and much easier for experienced traders. The system of Ayrex in regards to money is great. As it is secured and fast in regards to transactions. The downfall for me is that the money difference between USD and AUD is bit costly to me. Otherwise I enjoy practicing on Ayrex’s FREE demo account before I continue with real binary trading. the platform is such good and confiability , the best its they incentive you to start giving you 10$! i recomend this plataform ! Ayrex support team is very helpful and prompt cooperative. This is very important and necessary for every trader. I cannot forget their cooperation. Three contests in every week is also very good with 300 US$ prizes. Everyone can participate in these contests without losing own money. And the time span is very good which is only 1 hour. Ayrex is a good broker. The customer service is good. I won the contest twice the money was deposited into my account right away there was no problems. The one hour Ayrex contest is cool. It practice me to trade better. I love to attend the contest it give me new and new more strategy. This was a very nice introduction to this binary trading forum for me. I first practised a strategy on the free demo account. The platform is very efficient and the trades are executed immediately. I liked a lot that you can work with small trades starting at $5. great platform, gives 30$ welcome bonus which is great for a person who can trade and can’t afford to deposit they also have a contest where you compete with other great traders which helps with your trading also if youre in the top 10 you get a monetary reward. they have deposit as low as 5$ and trade as low as 5$ also a plus the only down side is that they dont accept us citizens. But great broker overall. I’ve used the ayrex platform and I must say that it’s really user-friendly. I also had a chance to interact with the staff who are very helpful and reliable. Ayrex is new to me but I wouldn’t hesitate to recommend them to anyone interested in binary options. Its been a while since i became acquainted with Ayrex trading site. I truly appreciate Ayrex demo platform with multiple binary option types particularly the “touch binary options”. Ayrex enhances their site now and again to make it more easy to understand and better platform speed. I also like the feature that you can hide inactive assets so I could see and pick current active assets without much delay. I’ve attempted and practiced all modes accessible at demo platform and I believe it’s the ideal time for me to open a real trading account with Ayrex. I’m sure that I finally found my favorite binary option broker. ayrex is best binary broker. i trade with ayrex. nice platform, fast withdrawal, fast verification friend full 24 hours live support. i refer client all client make good profit withdrawal is no problem with big profit. i think wonderful brokar & best brokar in asia. After wasting both time and money finally I got ayrex binary trading which make my trading comfortable. Ayrex has many distinctive features but the best one which I like the most is instant automatic withdrawal. Now I can withdraw my profits 24/7. Easy deposit and easy withdrawal, contest, bonus, quickest platform to execute trade and wide variety of currency and commodities and many more you can find here. In my opinion ayrex is the world’s best. I am a Binary Option trader experienced with many brokers in this field. But Ayrex have the very best supporting team a ever met in this field. They online 24 hour to fulfill our issues at any time and also with very friendly manner. I got lots of helps from that Ayerx team and i wont believe that kind of instant and useful service at the time i join with Ayrex. Please be share your issues with that supporting team and they will help you instantly. Thanks Ayrex team. You are the best. With few year binary option experience, i realized the Ayrex is a one of very best Binary option Broker. They give us a 30$ of No deposit bonus to start our journey with them, and we can earn up to 200$ from that bonus. my lots of followers earn that 200 and they are also stick with the Ayrex as me. I recommend to you to join with the Ayrex without any hesitating. Thanks Ayrex. Good luck all. This corridor is very good, recommend, is easy to use, has good opportunities to make money, I recommend that the rules are studied because they are very demanding, conducts contests every week, the minimum investment per trade is $ 5, plus you get a bonus, but I advise you consult your support and ask the rules. very professional. Settling on Ayrex as my binary options broker was a very simple choice. Ayrex made everything very easy from platform execution to their customer support. They have one of the best support ‘via Online Chat’ I have experienced; I get answers promptly. Apart form enjoying their generous bonuses; I also get to participate in their weekly demo contests for free while standing a chance to win $100 three times a week. Thanks Ayrex. I’ve used a lot of brokers and I have to say that Ayrex has one of the best platforms I’ve seen. It’s fast, accurate and easy to use, executing the trades exactly on the entry point you take. The platform is also easy on your computer and internet, it doesn’t take a lot of resources. The automatic withdrawals is also something that I haven’t seen before. And their payout percentages on wins are very good, 70% to even 80%, I think even 82% at specific hours for some currencies.